The Yamaha FS1-E is a 1970s icon. Introduced in the early Ã†70s, it became an instant success, giving 16-year-olds their first taste of motorcycle performance and freedom, and totally overshadowing the other mopeds available at that time. Many riders had their FS1-E for one year only before progressing to larger machines. Today, nostalgia for the youthful exuberance engendered by the 'Fizzie' has resulted in many ex-owners wanting to recreate their pride and joy. Most FS1-Es have not endured the test of time well, and very few good original examples exist. 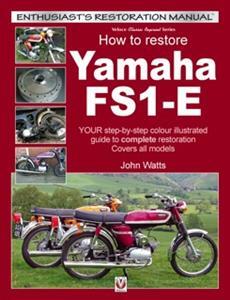 There are, however, plenty of restorable machines around, and this book guides the do-it-yourself restorer through the process, from the minefield of initially finding a machine to restore, to the potential pitfalls of a first restoration. The bikes featured and photographed for the book include a seriously neglected 1974 machine, a part restored 1976 model Ã» of dubious type, and a 1975 DX model which arrived as a pile of bits.